Yesterday, Brady's birthday party was a success other than the fact that he completely melted down after DH left to go pick up the pizza. I hope everyone had fun. I tried to even though my little man decided that since it was his party, he could do whatever he wanted like eat M&Ms by the handful before lunch, dumping popcorn EVERYWHERE, and throwing fits. What can you do? Today, we are going to celebrate Dustin's birthday which is actually tomorrow. I made this card for him, but I don't like it very much. I'll probably try it again. This card uses a sketch from the Stampin Out Alzheimer's event. I'm going to try to get more of the challenges done before we head out today. The stamp set is Unity's Birthday Chic. Off to create! Happy Sunday everyone! 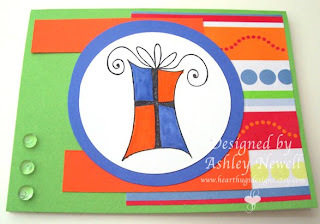 I just love this bright and cheery card. Glad Brady had a great time. Super cute and bright card!!! Awwww, this is a great card! Happy Birthday to Brady and Dustin! LOL. Brady sounded like he was in rare form! Too much sugar?! I like the colorful design Ash!! I have such a hard time making cards for guys!! Happy birthdays to your boys!!! I agree with StampinCathy, I love the brightness and cheerfulness of the card! Sorry Brady was a handful...it's his party ya know?! I wish I would have had time to participate in the altzheimrs event. Oh well. I hope they do it next year. I love that little present stamp!